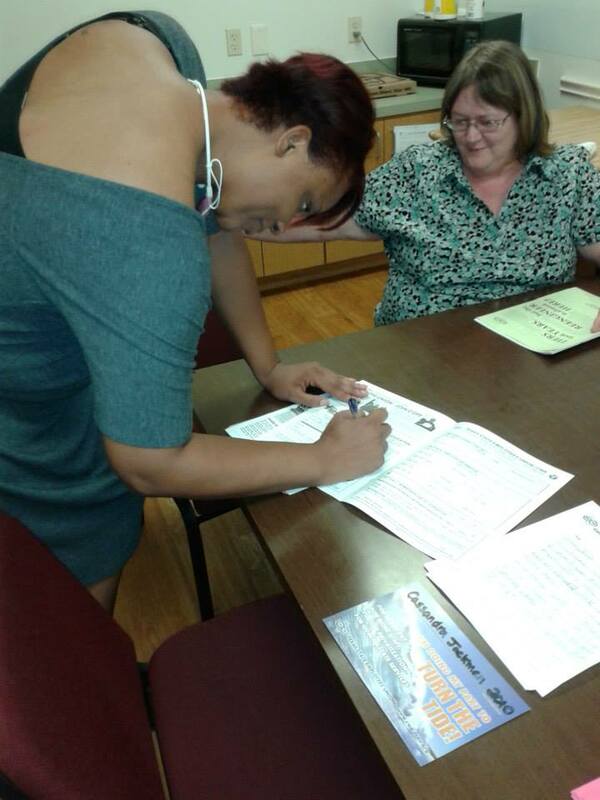 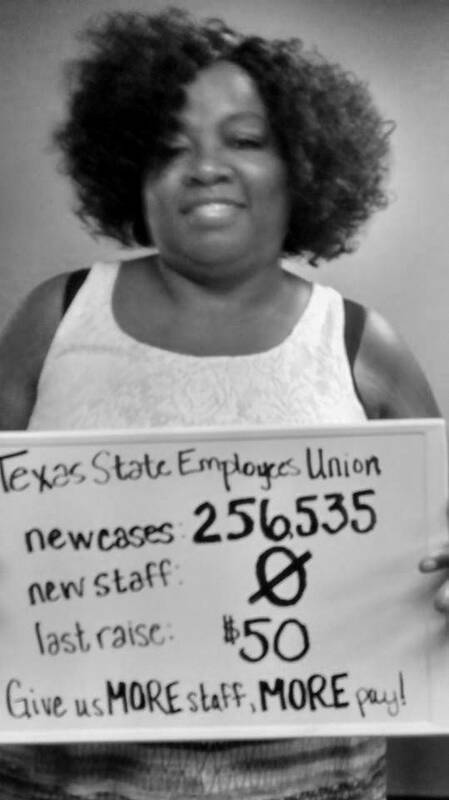 We are Texas Human Services TSEU members. 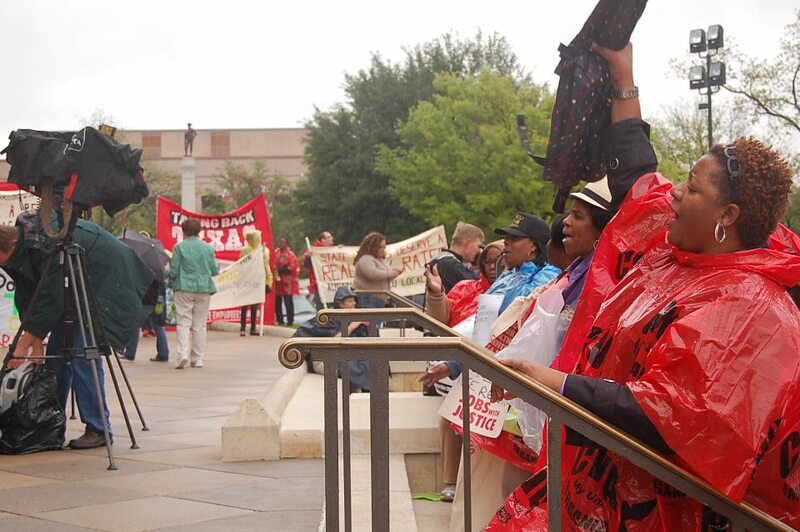 Together, we are organizing and mobilizing to TURN THE TIDE on low pay and high workloads in the Health and Human Services Commission and the Department of Aging and Disability Services. 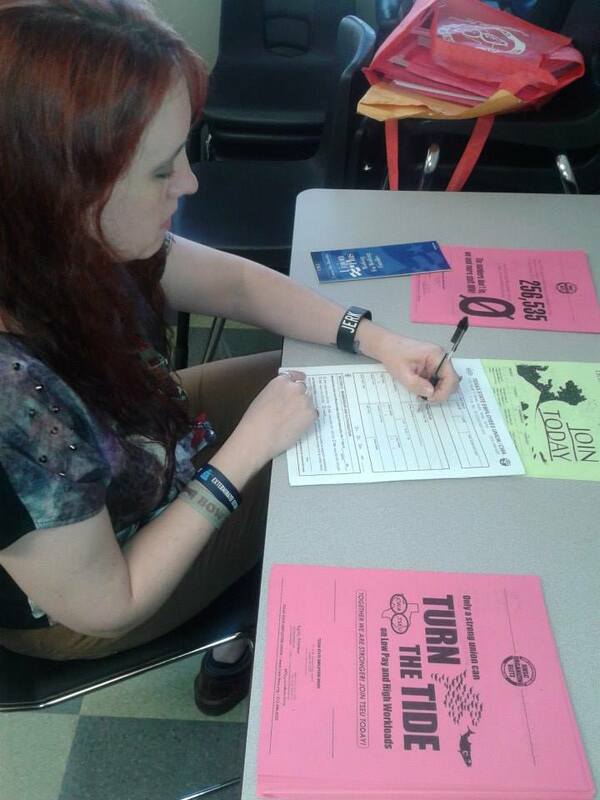 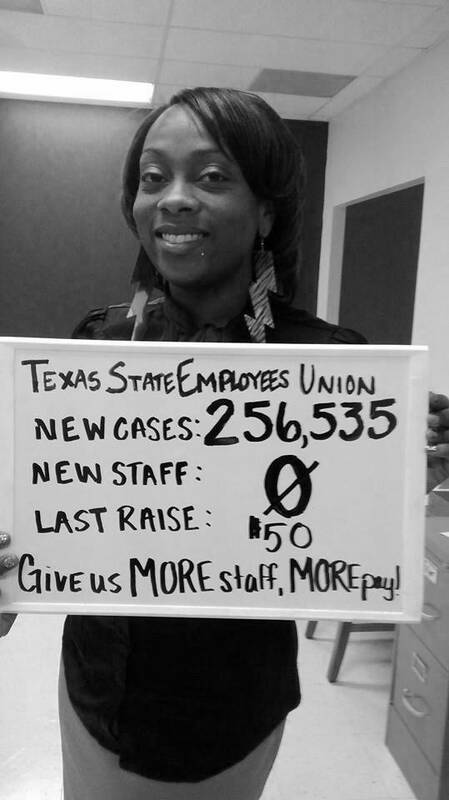 We are future TSEU Activists! 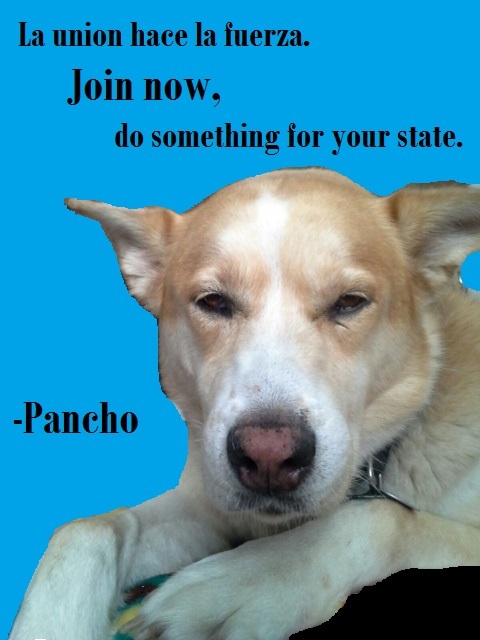 Together, with Pancho the Union Dog, we are organizing and mobilizing for more smiles, more laughter, and a brighter tomorrow! 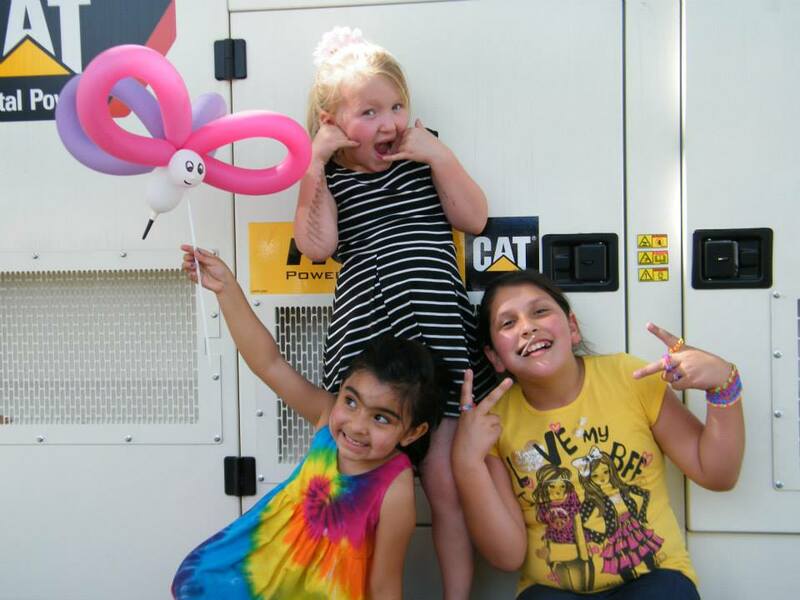 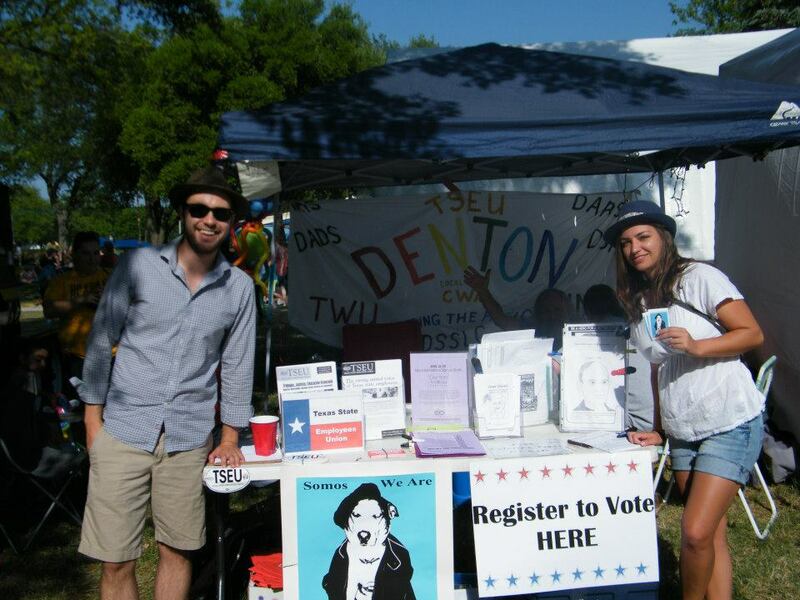 Check out more photos of TSEU members at the 2014 Denton Arts and Jazz Festival by CLICKING HERE. 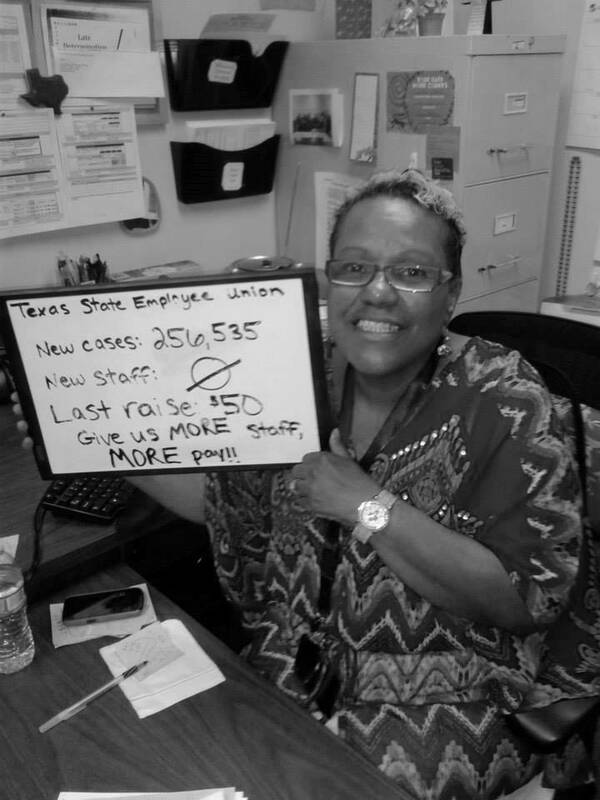 Kids, tell your parents to JOIN TSEU today! 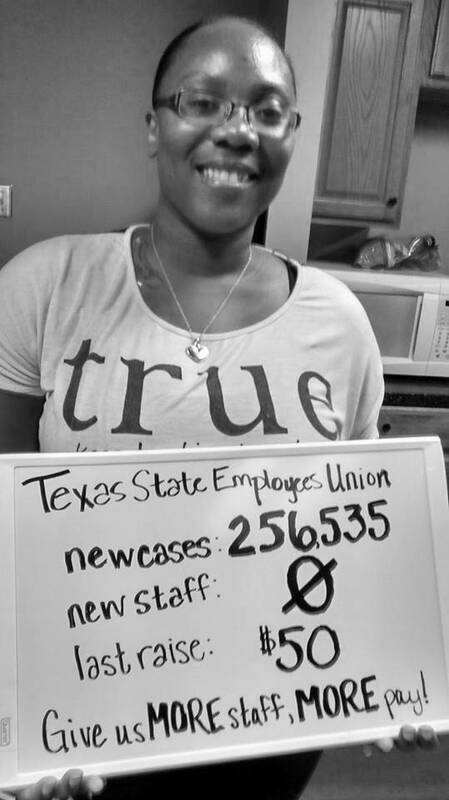 We are the Save Our Community Coalition, a group of student and community organizations with the backing of alumni, donors and professors that are pushing the University of Texas to live up to its core values and protect UT campus workers by not eliminating and outsourcing their jobs. 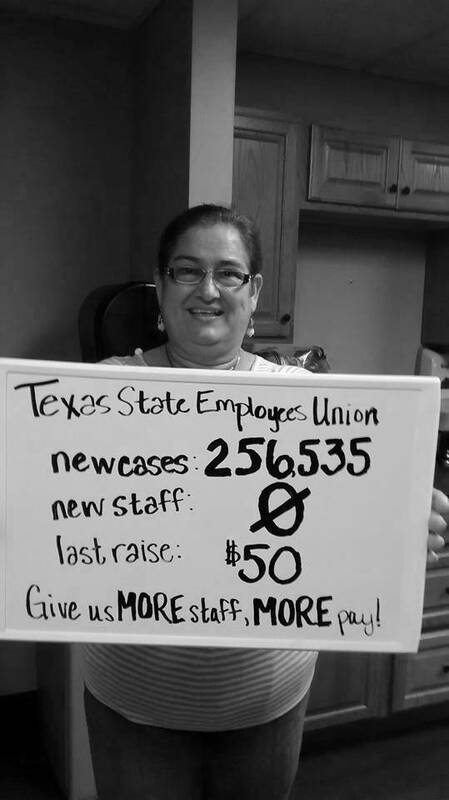 We call on UT Chancellor Cigarroa and UT Austin President Powers to stop any further contracts with the corrupt consulting and outsourcing firm, Accenture. 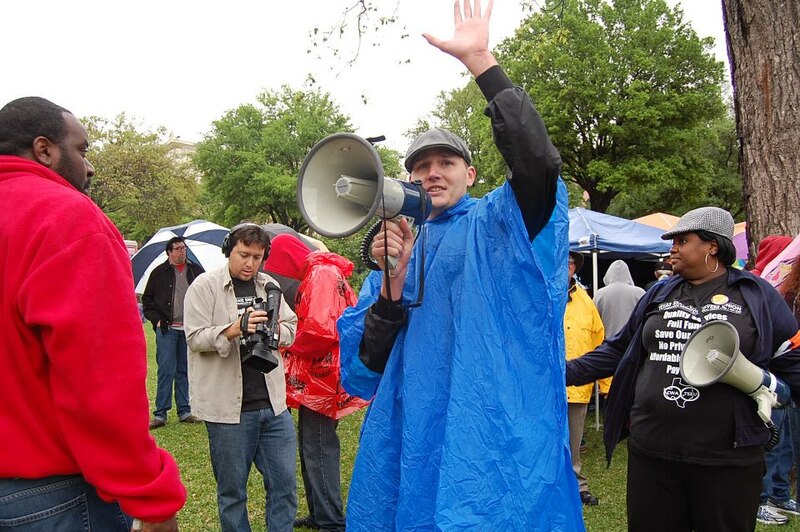 Prominent Coalition partners include the Workers Defense Project (WDP), Texas State Employees Union (TSEU), Oxfam, University Leadership Initiative (ULI), Native American & Indigenous Collective (NAIC), Queer People of Color and Allies (QPOCA), Texas Fair Trade Coalition, Education Austin, and United Students Against Sweatshops (USAS). 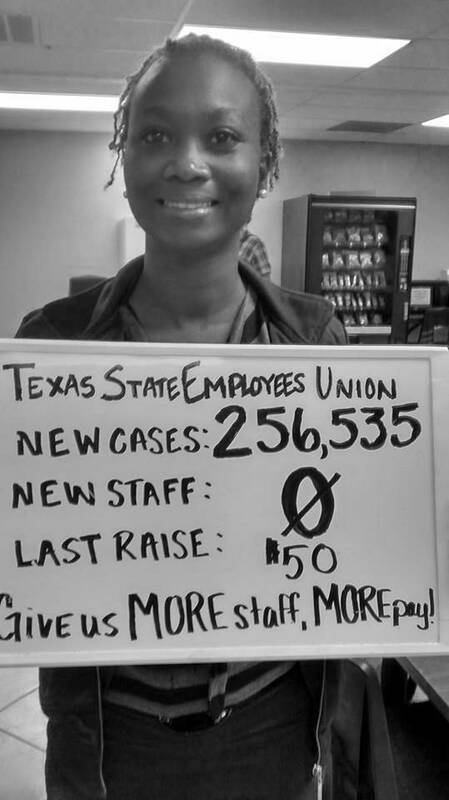 Visit SAVE OUR UT and sign the petition to stop SHARED SERVICES and the corporate takeover of the University of Texas at Austin. 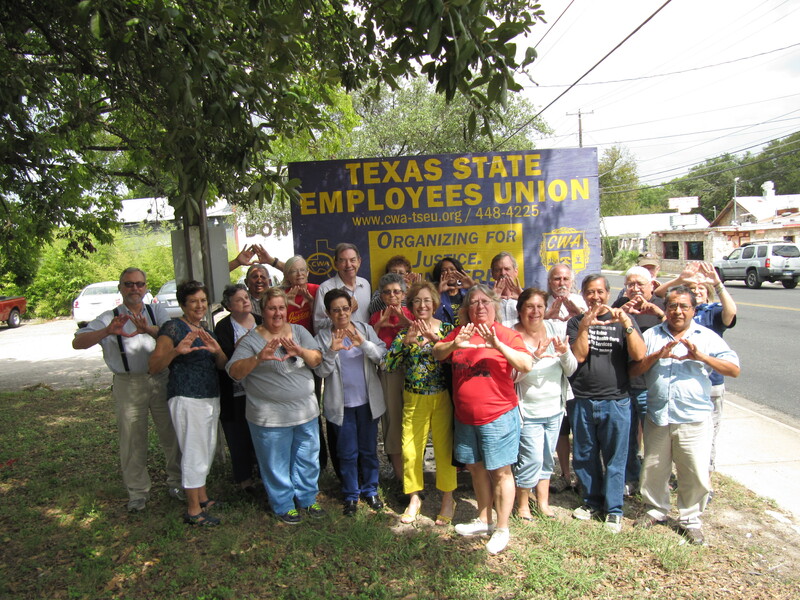 We are TSEU members of the Retiree Organizing Committee (ROC). 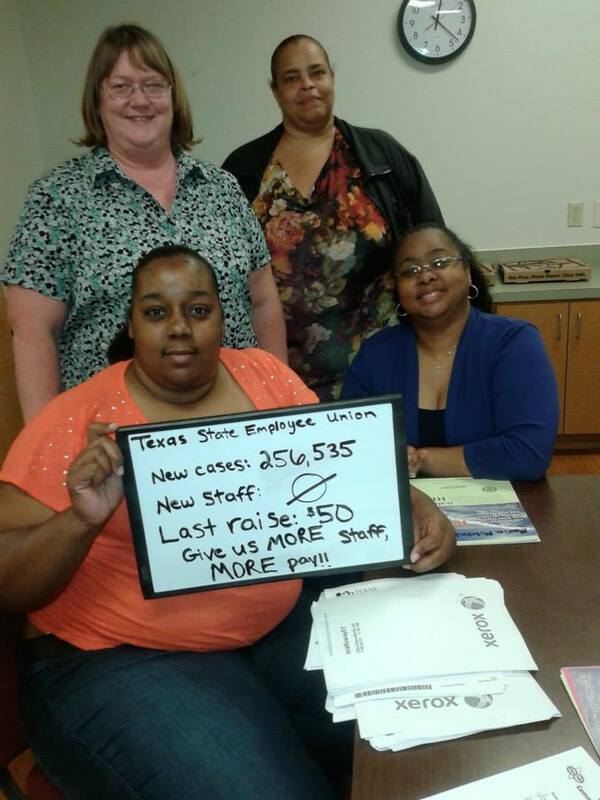 We are TRS and ERS retirees from state agencies and universities. 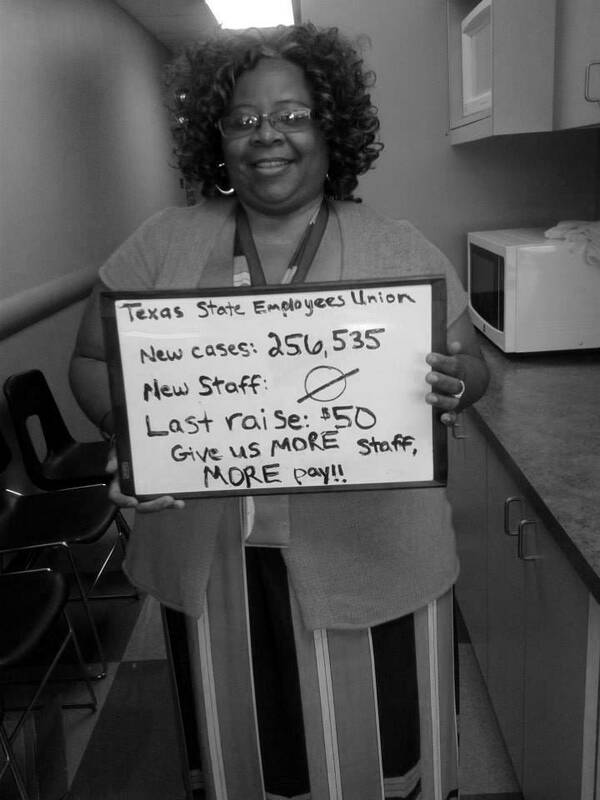 We are building a strong union of retirees to fight for: a cost-of-living increase for TRS and ERS annuitants; keeping the ERS and TRS pensions secure; keeping the health care benefits affordable. 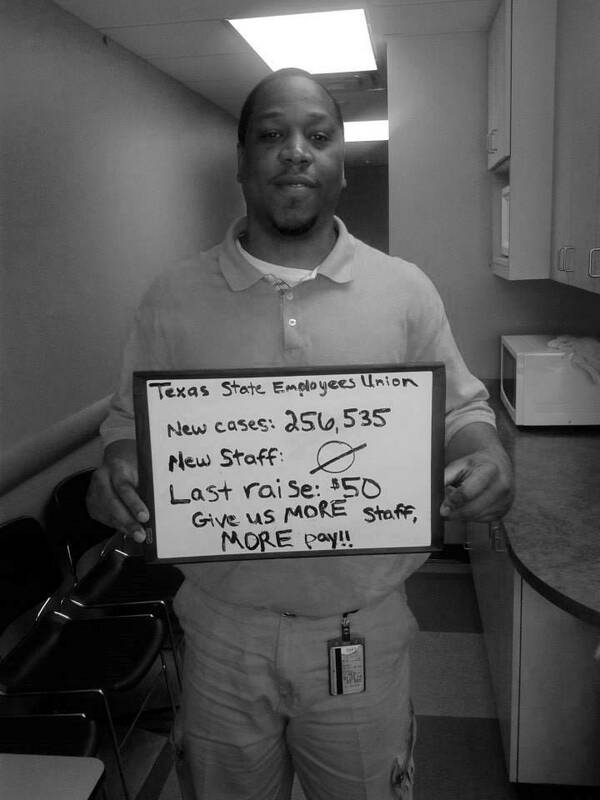 The ROC will organize to make our pensions rise! 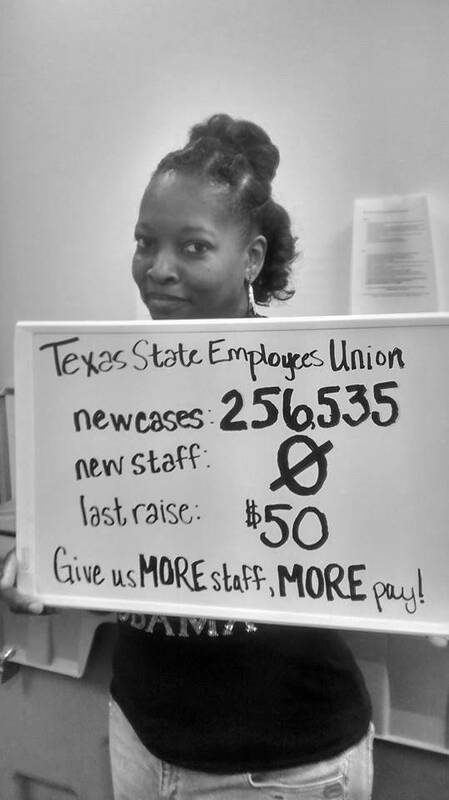 It is very easy to say why I joined TSEU. 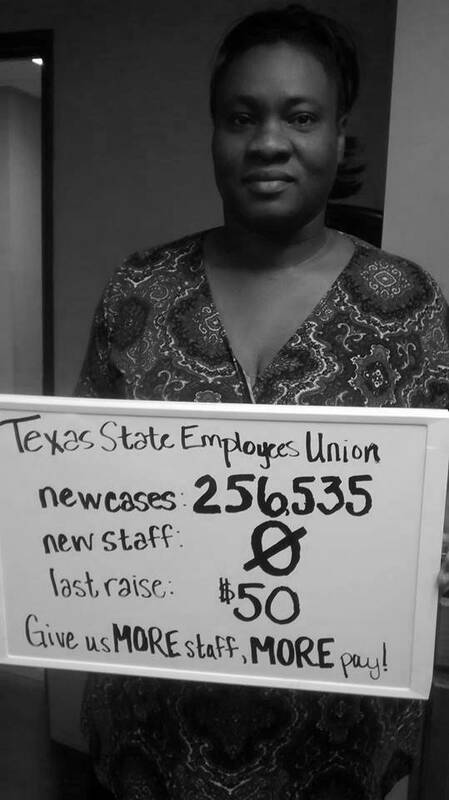 It was 2003, and a bill had passed that was going to close more than half of the offices that HHSC had open at the time. 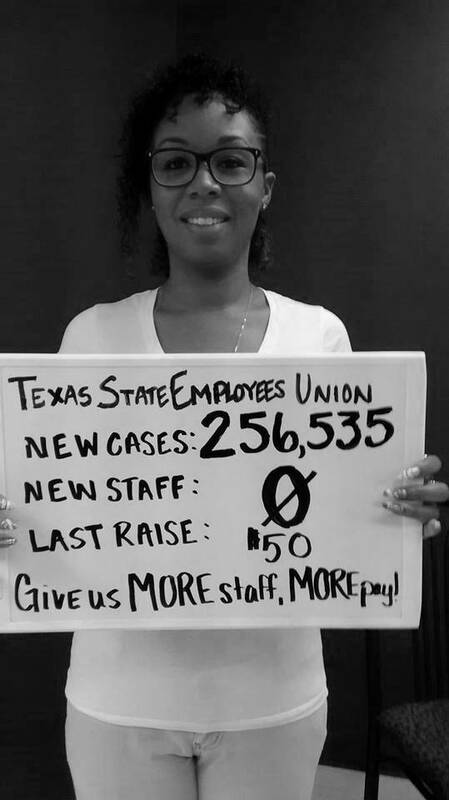 The bill would lay off approximately one third of staff. 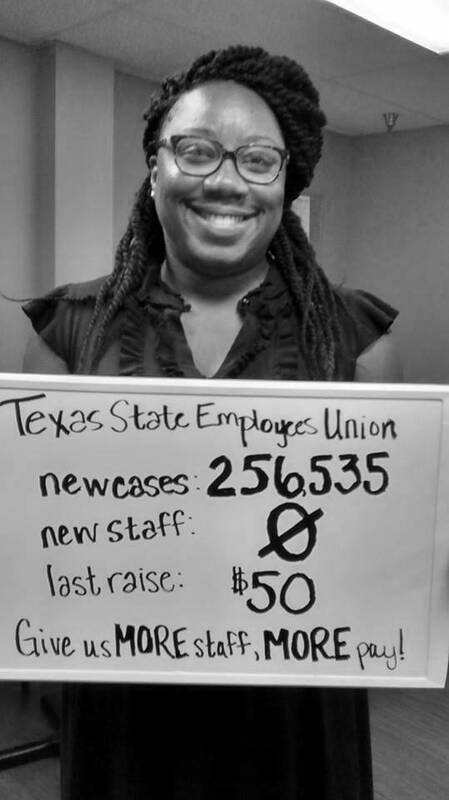 I wanted to join an organization that was fighting this bill. 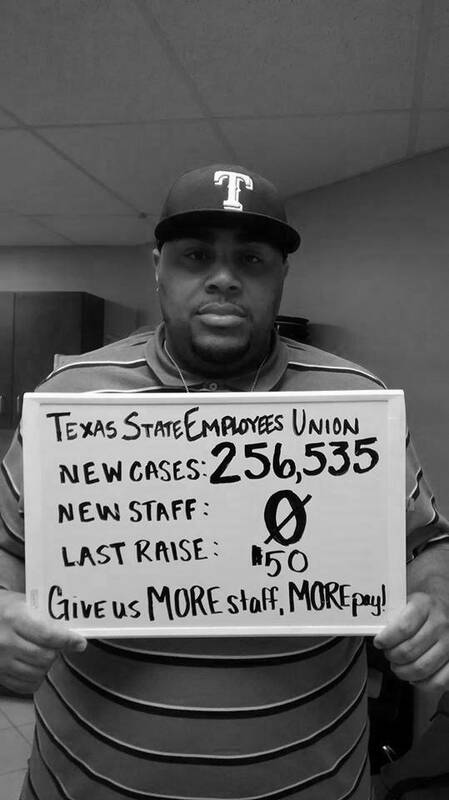 I did not know of any other organization out there doing this. 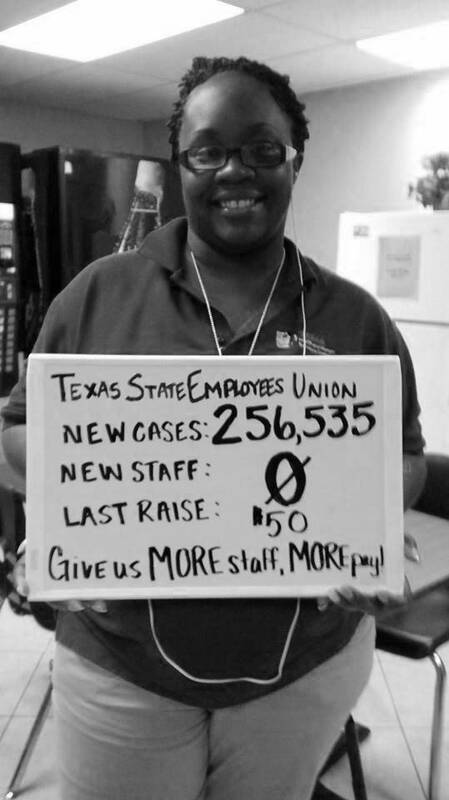 Why I have stayed and gotten involved and want to grow this union is something else. 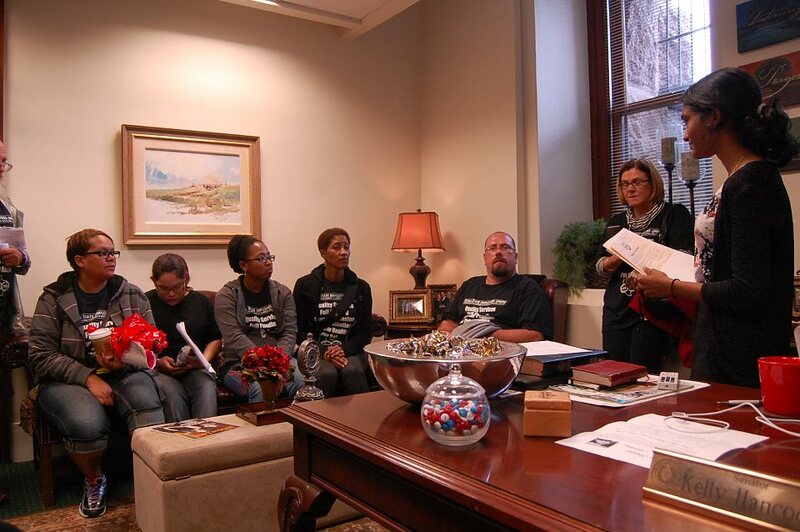 There is an empowering feeling of being with a group of your peers. 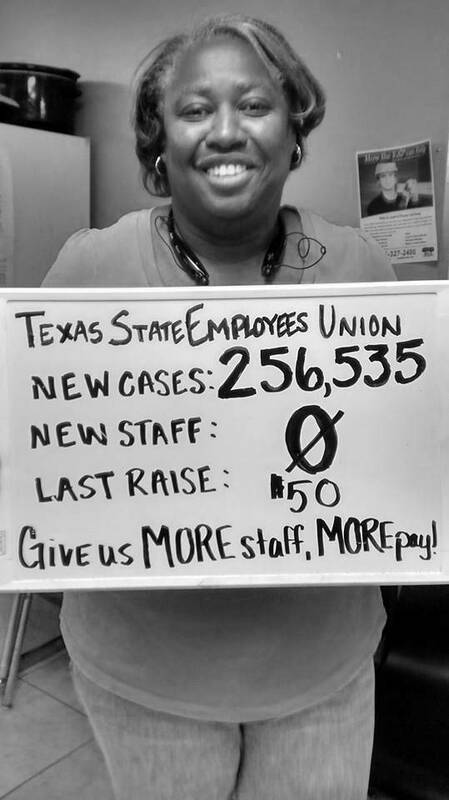 Only other state employees understand the challenges of working for this particular state. 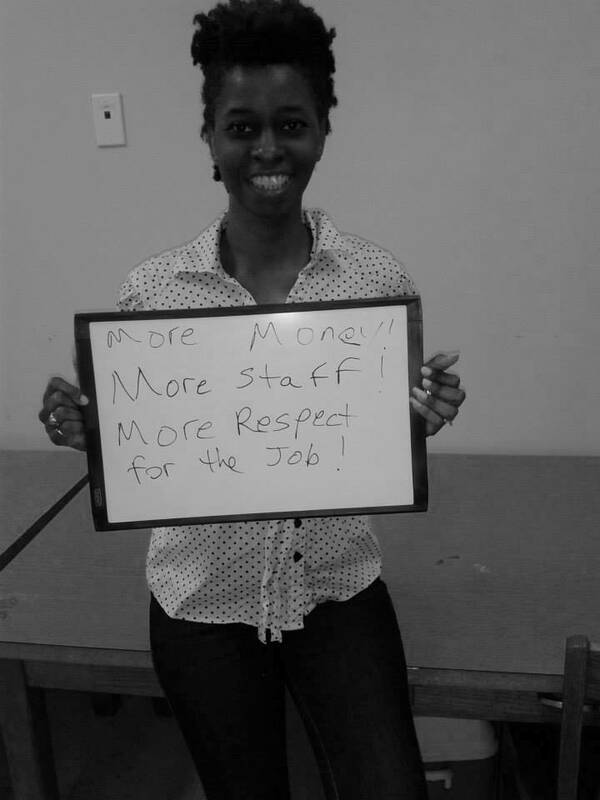 Most at the capitol do not want us here, are itching to privatize our services, lowering standards and removing public oversight. 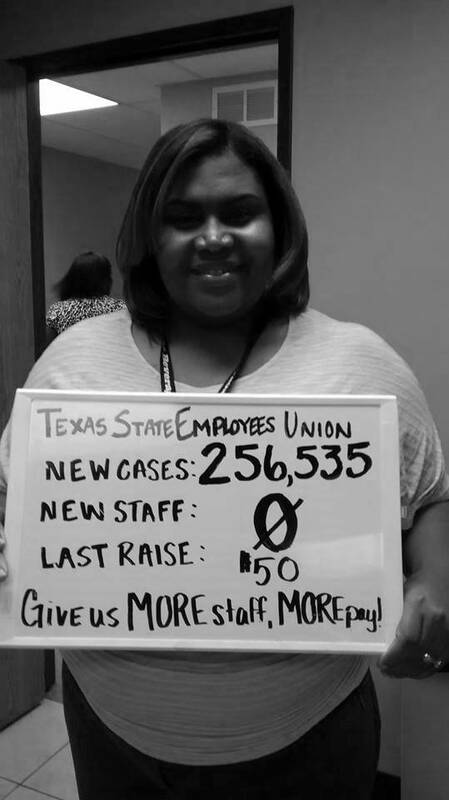 You have to stick around awhile and survive multiple legislative sessions to see how this works. 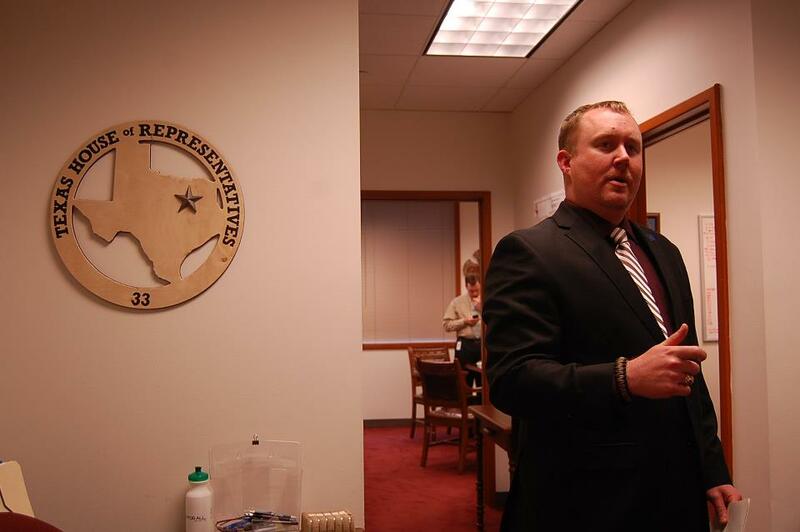 The biggest challenge is finding some way to speed up the realization about the legislature from the moment someone is hired as a state employee. 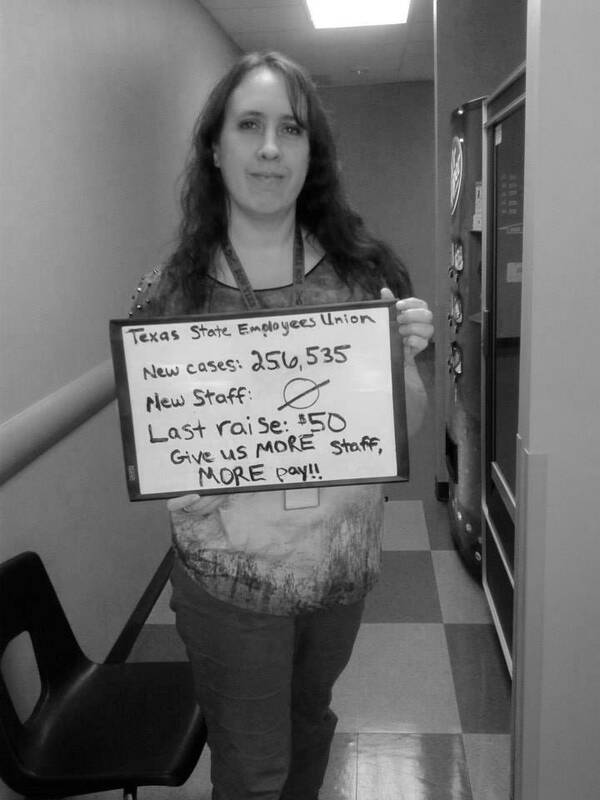 I spent many years oblivious to all of this, and it is frustrating to hear fellow employees with same notions. 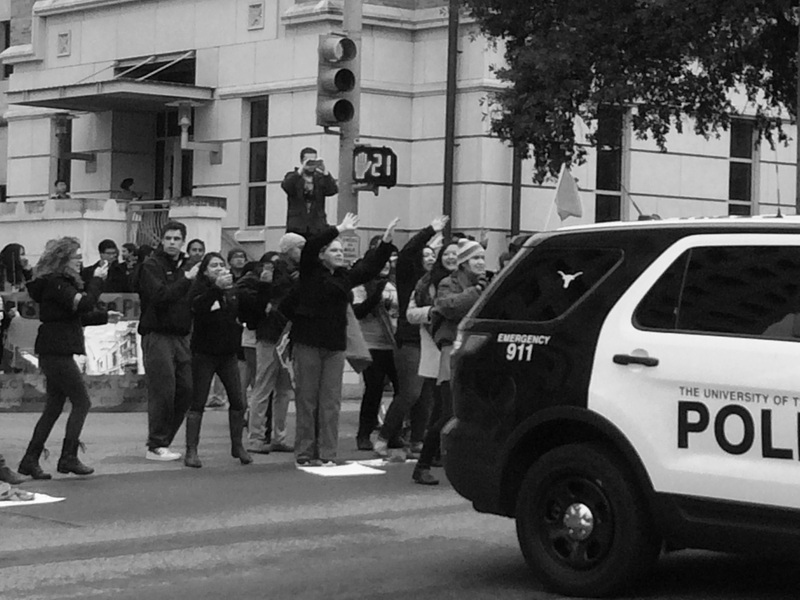 “Oh, I’ll just do this on my own. 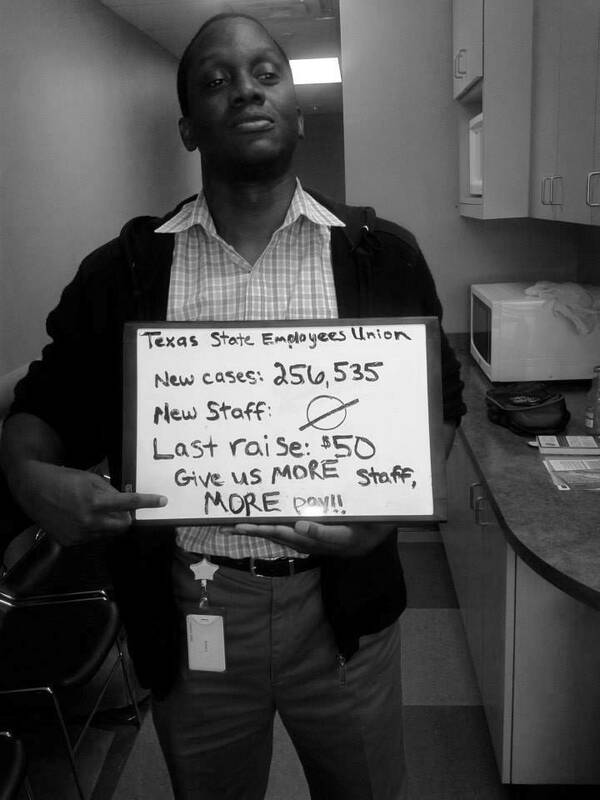 I don’t want to work in a group.” they say. 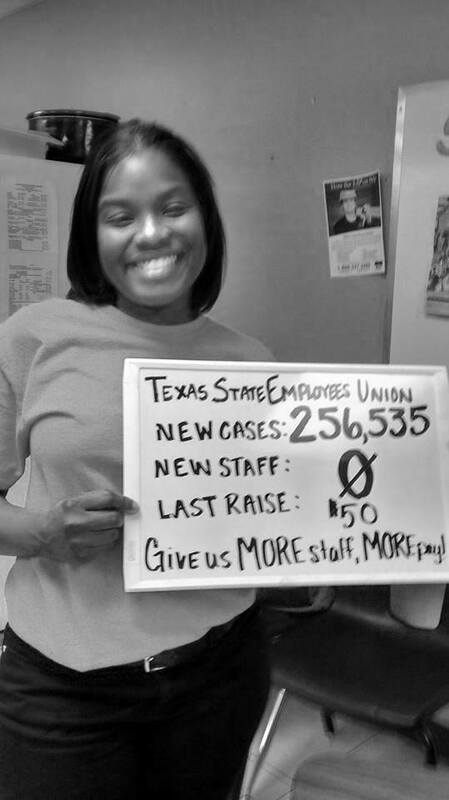 So I do my best to help them to have the light bulb go on, and if we can do this on a bigger scale, it will be so powerful! 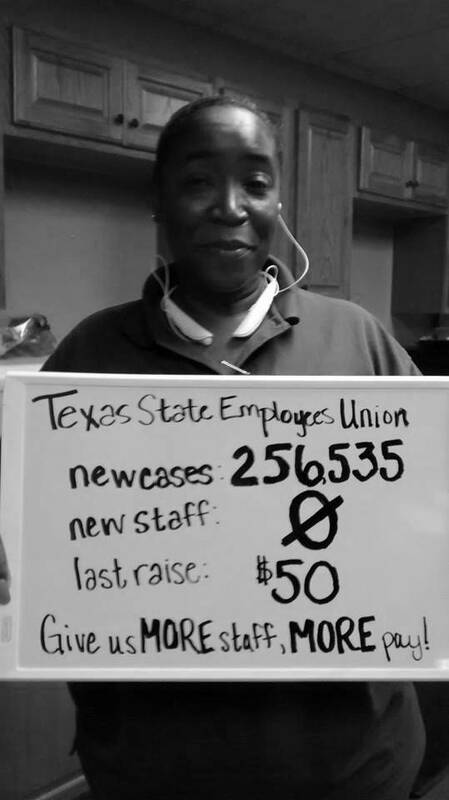 George has worked at the Denton State Supported Living Center for over 30 years. 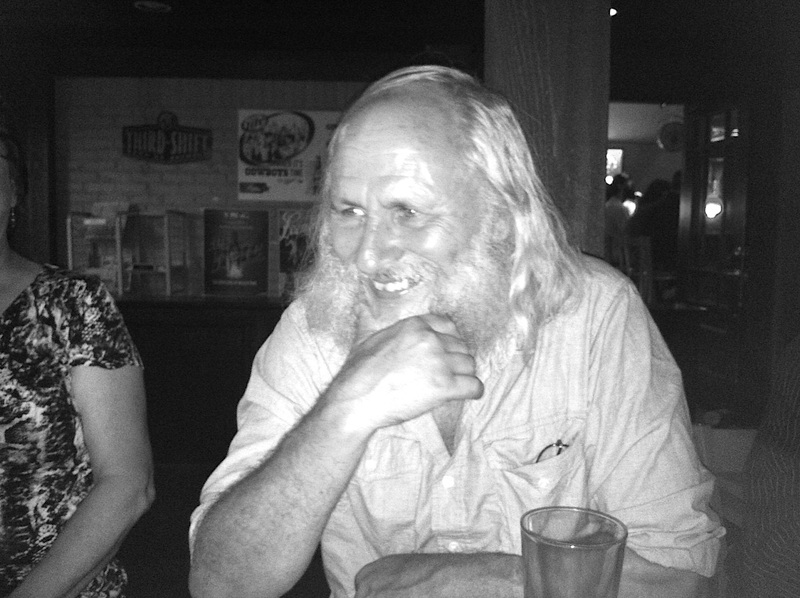 He works in Orthotics and runs the wheelchair shop. 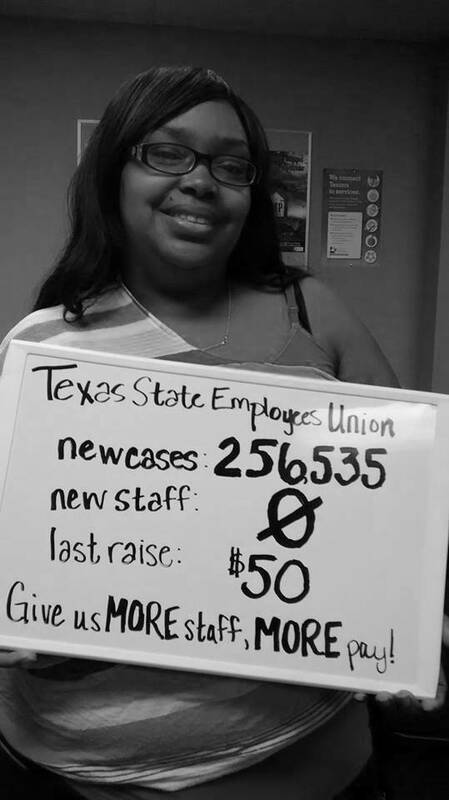 What members like YOU can do through TSEU! 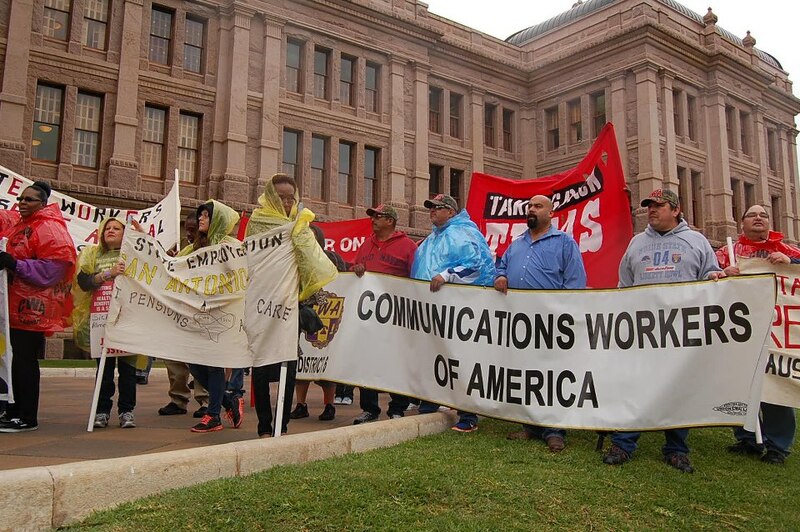 Members from across the state met in Austin for Lobby Day 2013 to engage lawmakers inside the Capitol. 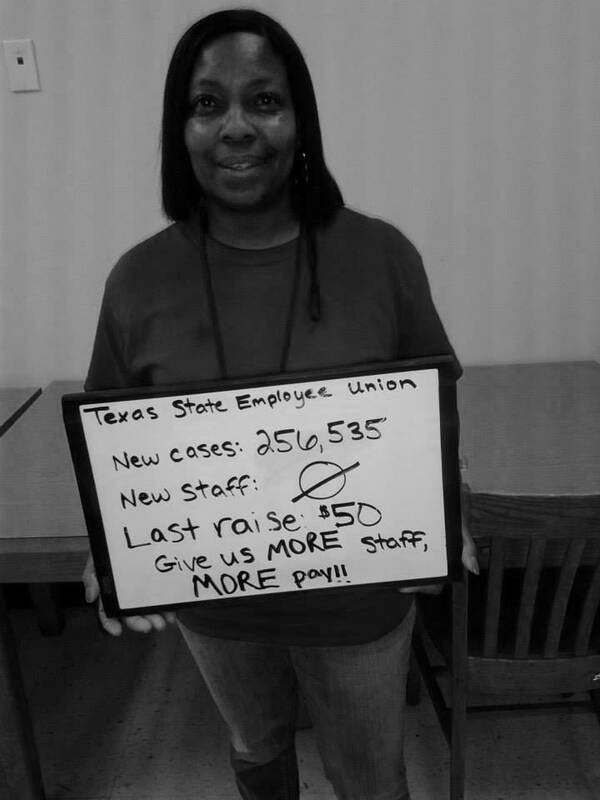 Follow this link to read a recap of all the hard work TSEU members did to protect pay raises, pensions, and healthcare. 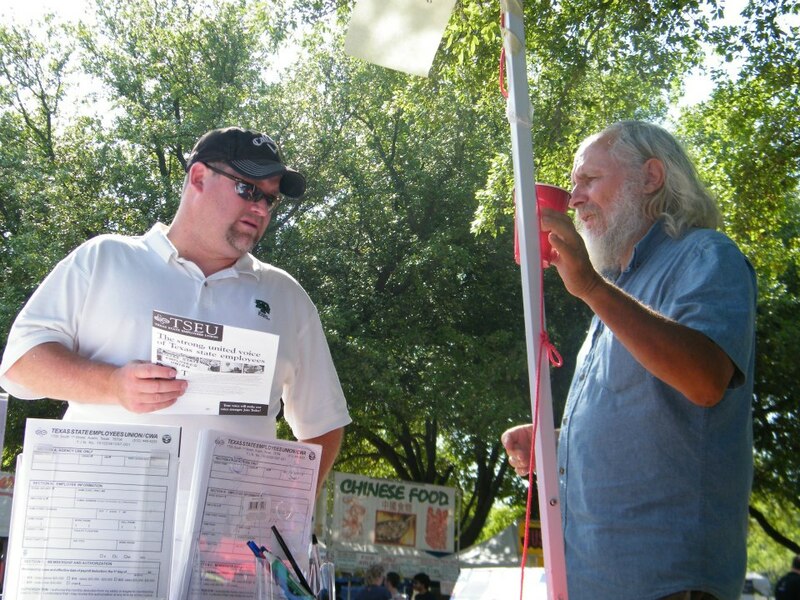 Members in the Denton area set up a booth at the Denton Arts and Jazz Festival again this year to get the word out to fellow state employees. 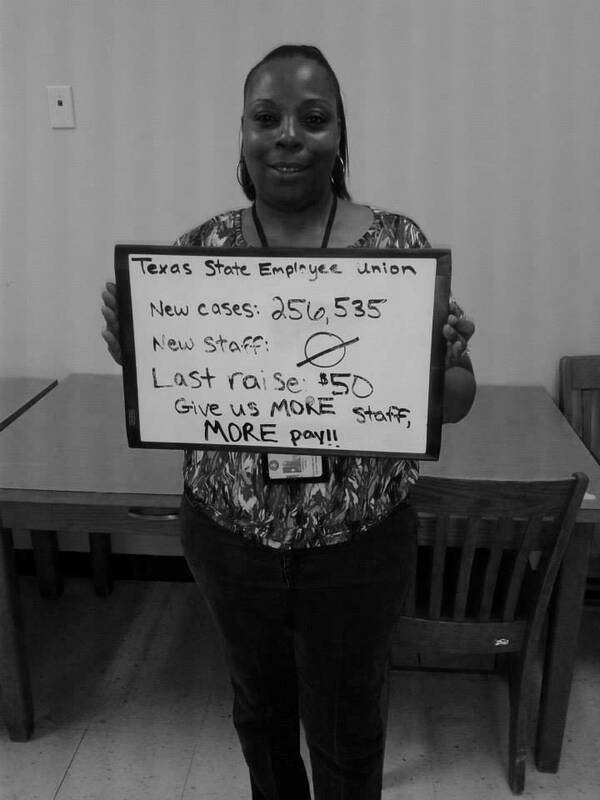 Because we believe in quality jobs and quality state services, join TSEU! 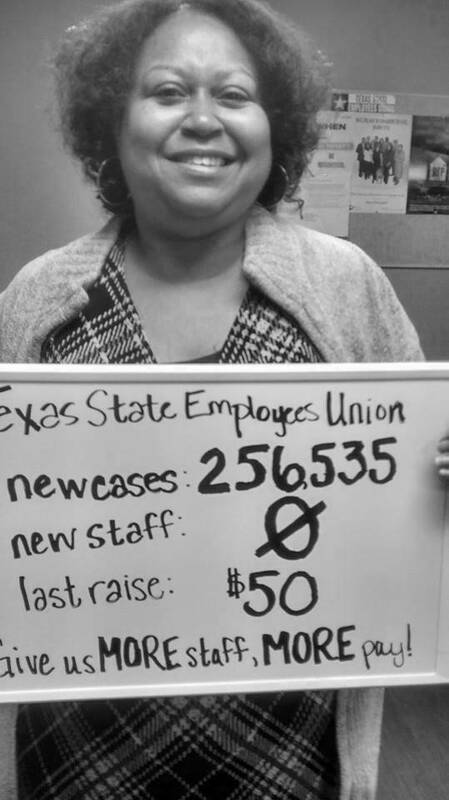 Somos / We Are State Employees! 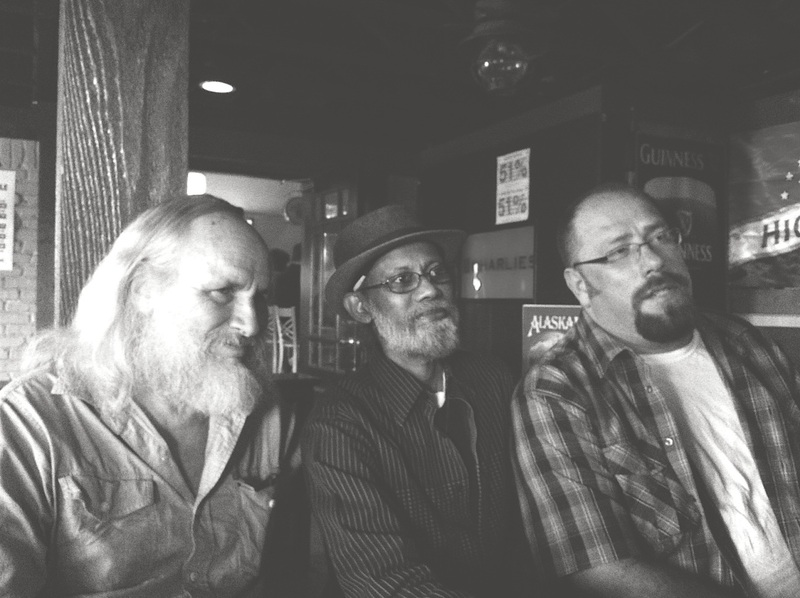 TSEU at The Denton Arts and Jazz Festival! 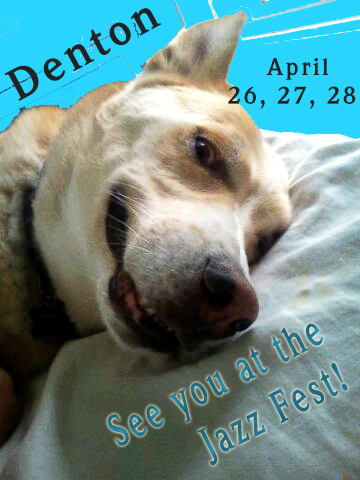 Find our booth, join TSEU, and meet Pancho the Union Dog! 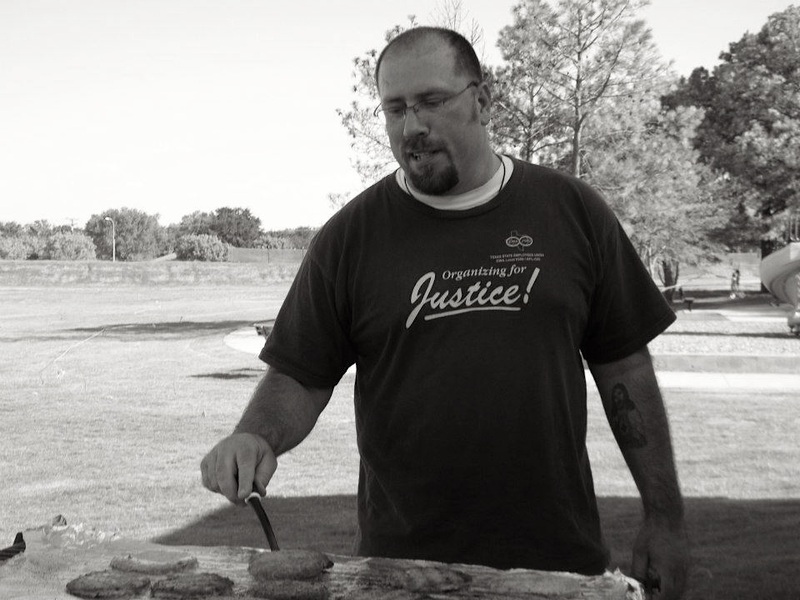 Members come by for a drink! 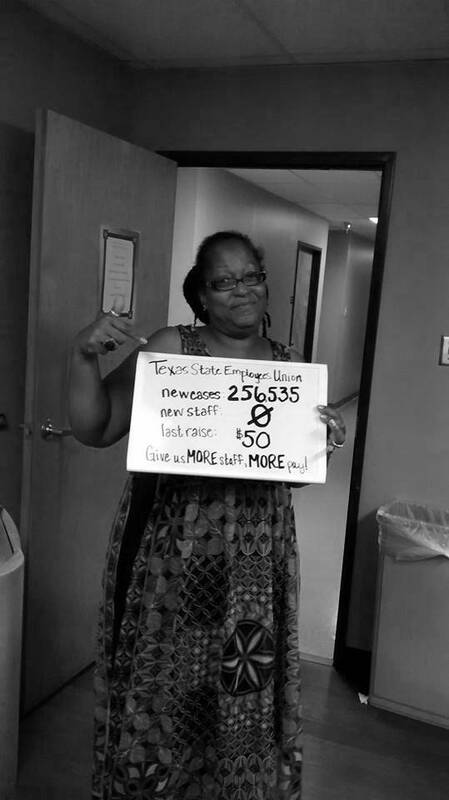 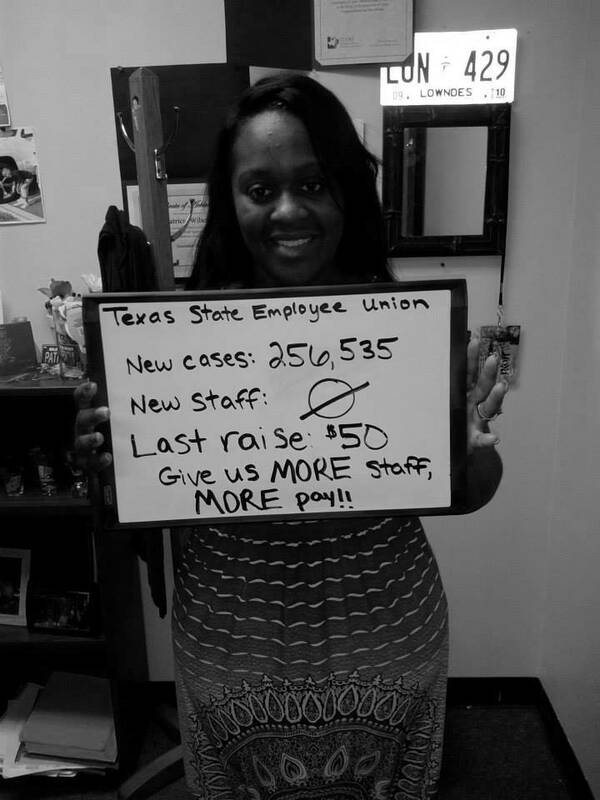 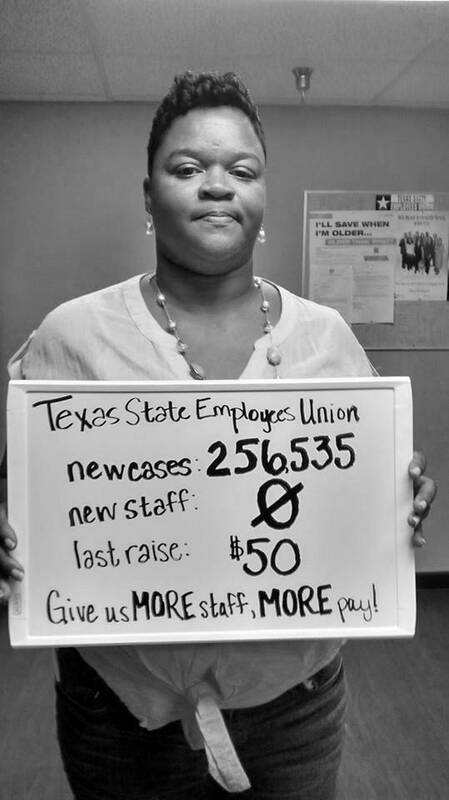 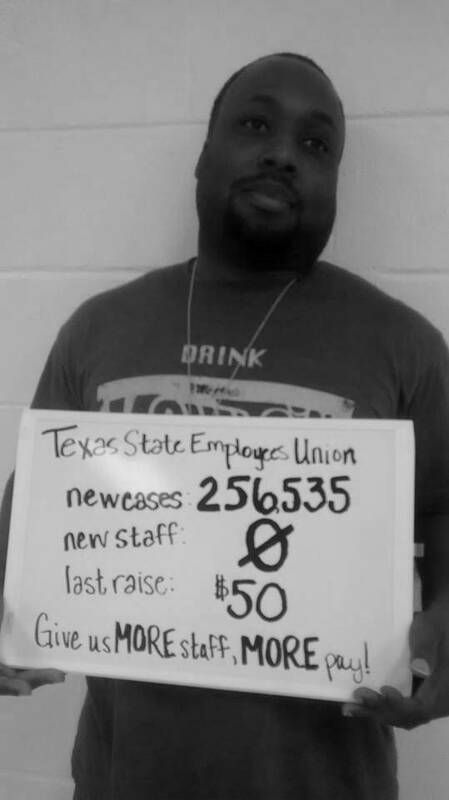 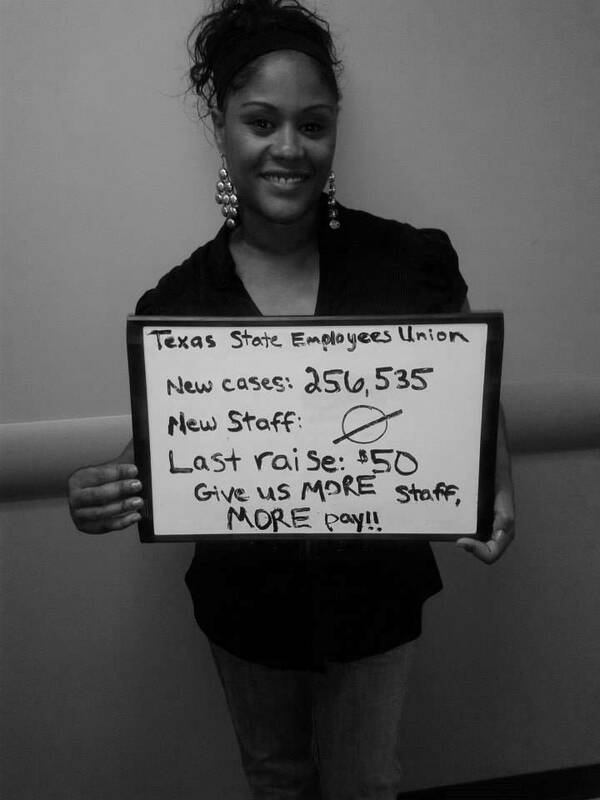 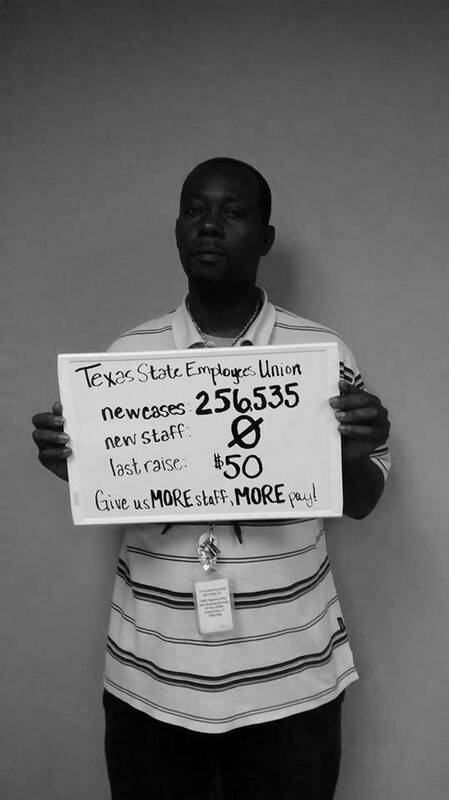 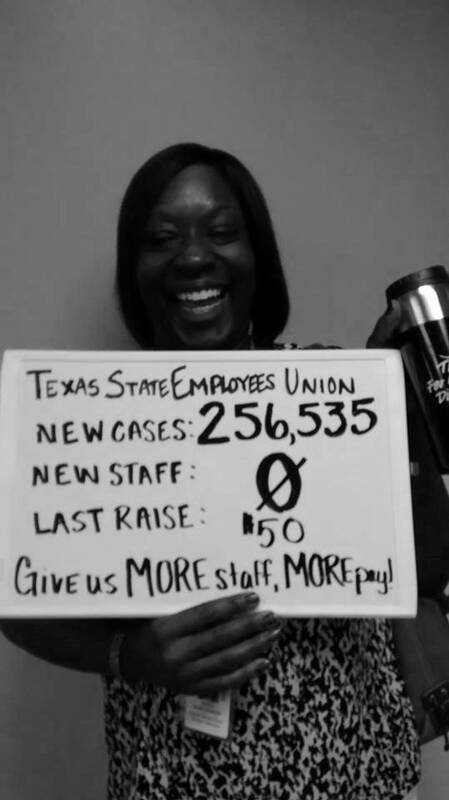 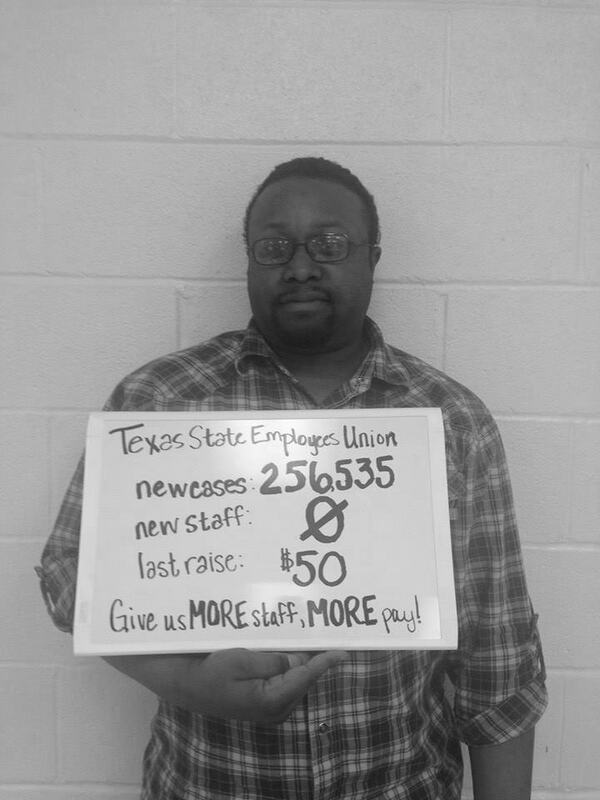 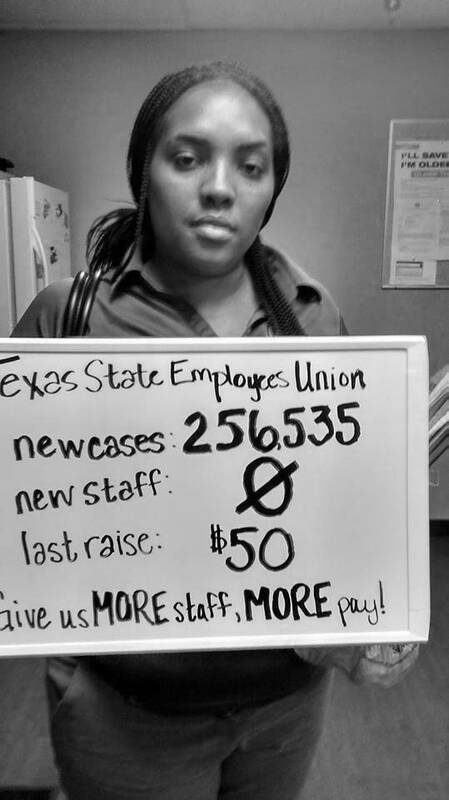 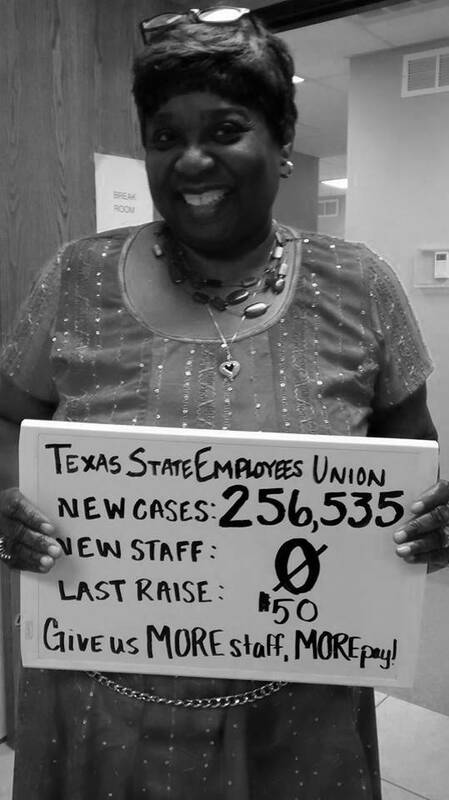 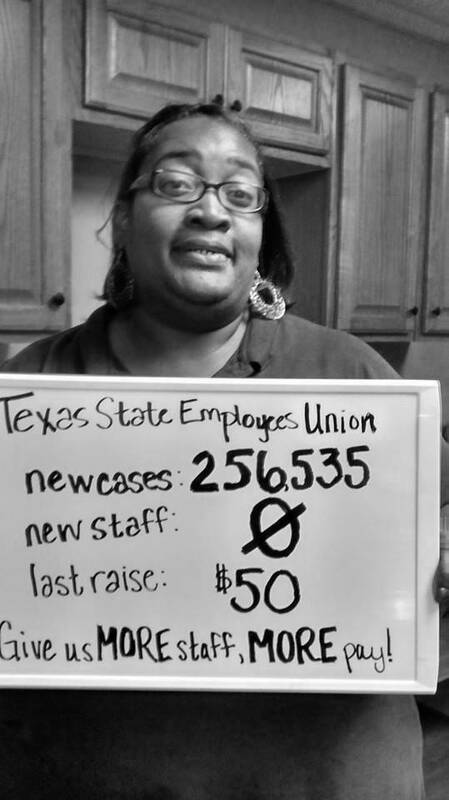 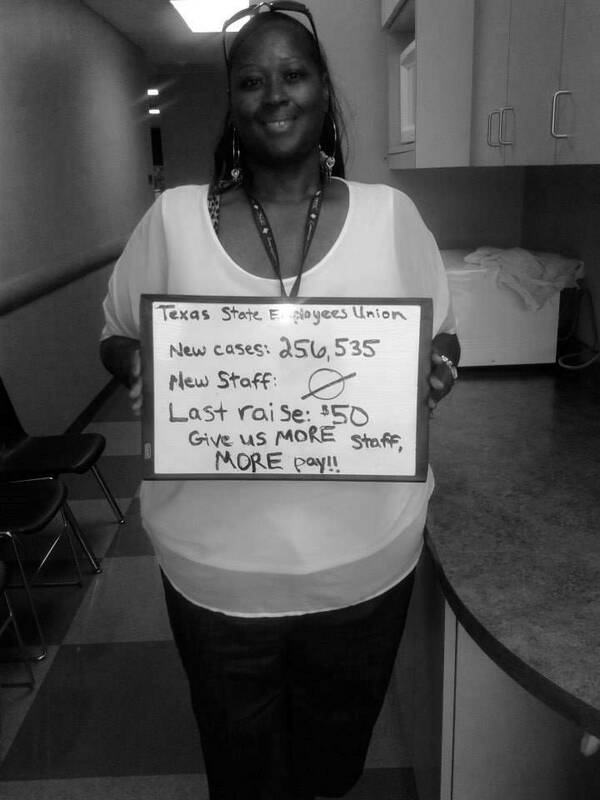 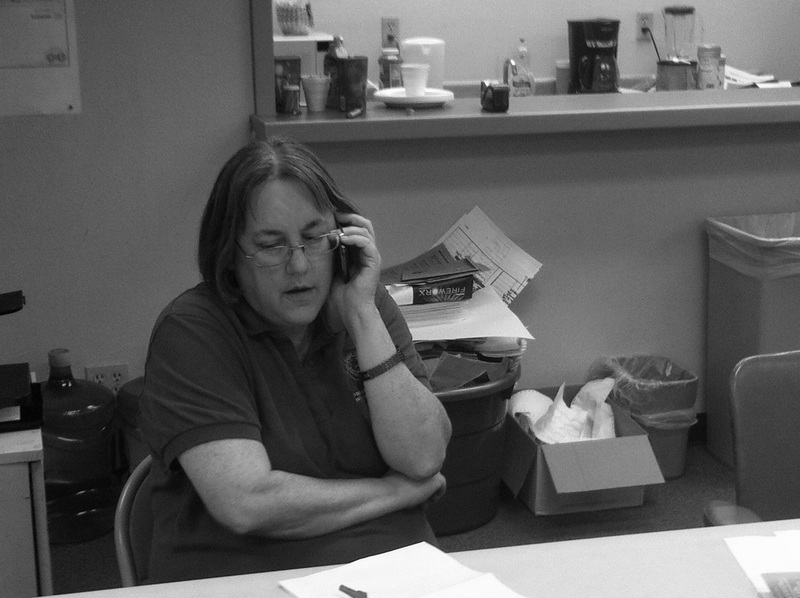 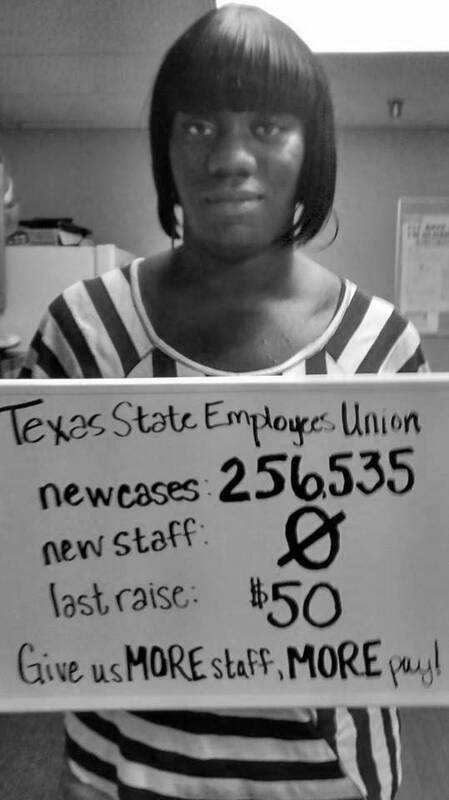 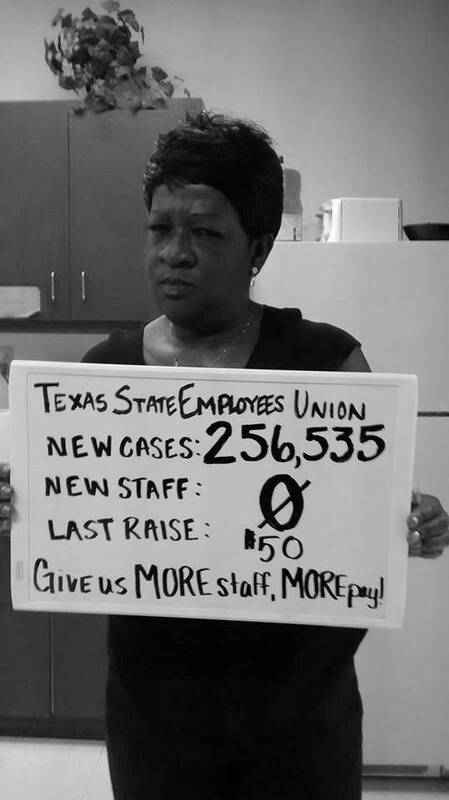 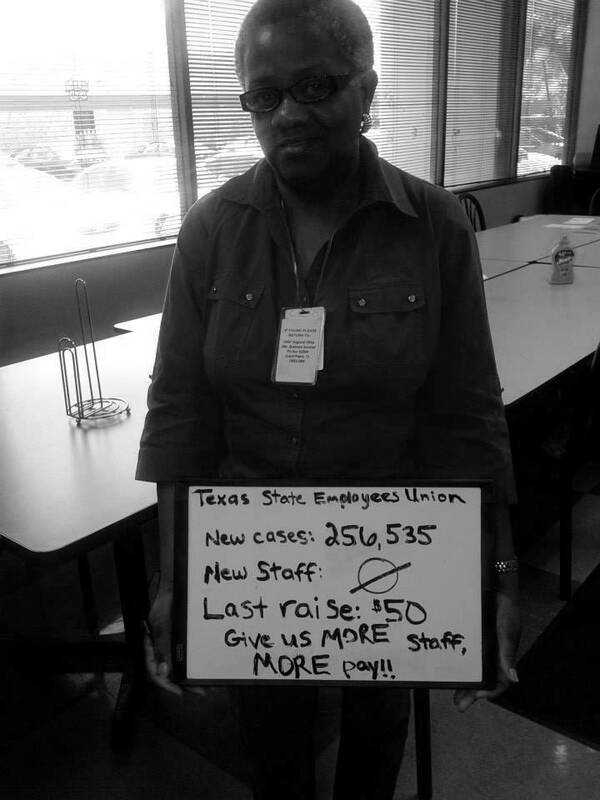 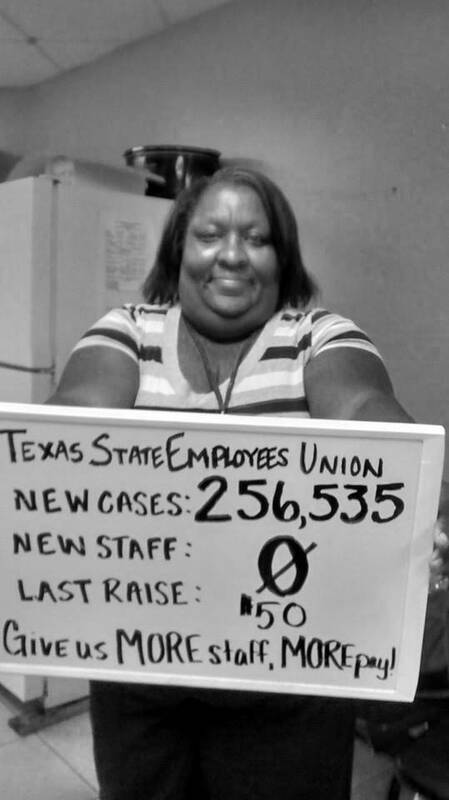 We Are Texas State Employees. 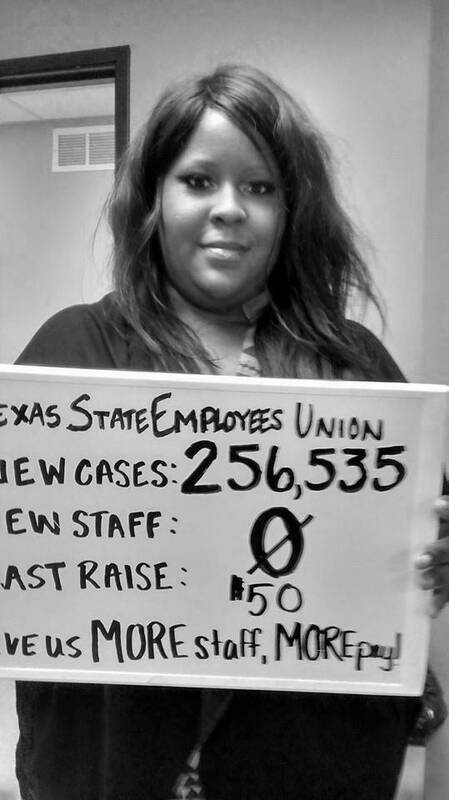 Higher Education, Health and Human Services, Family and Protective Services, Criminal Justice, Juvenile Justice, Parole, State Supported Living Centers / State Hospitals, Retirees. 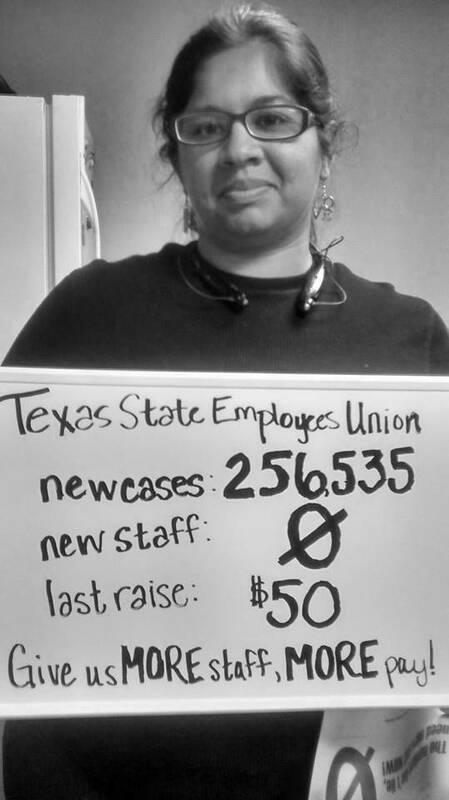 Somos empleados del estado de texas. 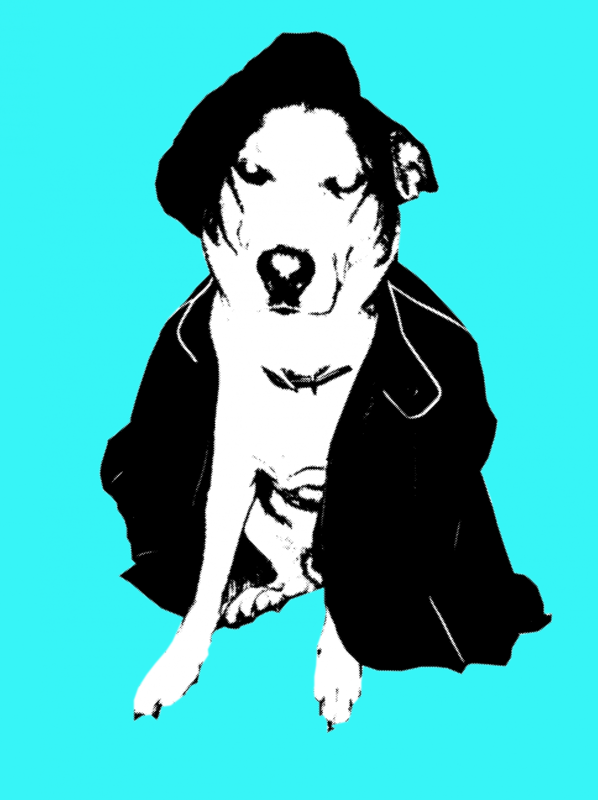 Educación Avanzada, Servicios de Salud, Familia y Servicios de Protección, Justicia Criminal, Justicia Juvenil, Libertad Condicional, Centros Residenciales con Apoyo Estatal, Jubilados. 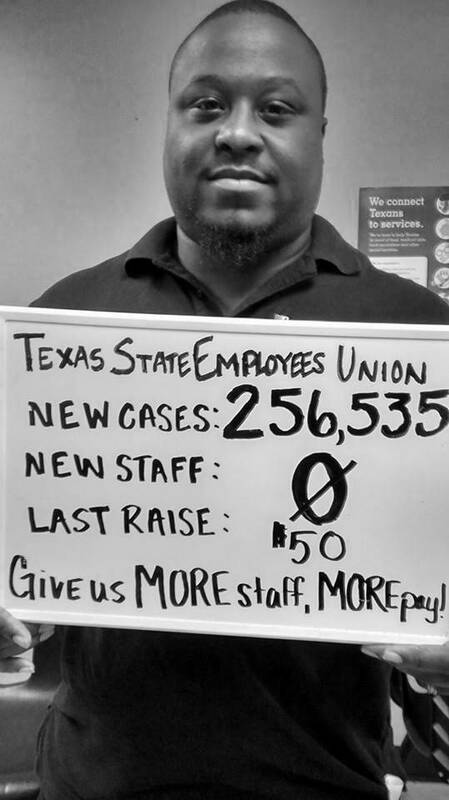 The Texas State Employees Union is the tool that Pancho uses to protect and advocate for our rights as public service workers in this great State of Texas. 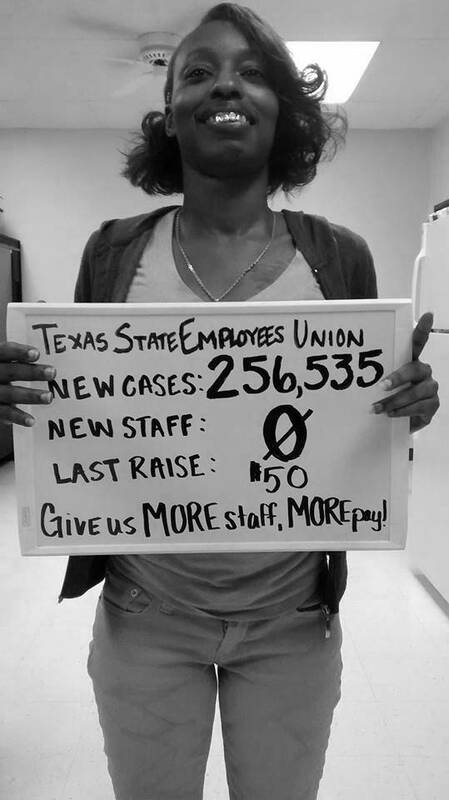 El Sindicato de los Empleados del Estado de Texas es la manera en que Pancho protege y propone nuestros derechos como empleados del servicio publico en el estado de Texas.